When she regained consciousness, Avery Shawler ’13 didn’t know where she was. She couldn’t see out of her left eye and the pain from her left arm was searing. With her right hand, she wiped gently over her brow. Looking down at her palm, she saw that it was covered in blood. The sight of blood and a few more seconds, or perhaps it was minutes, prompted Shawler to take stock of her injuries and circumstances. She was still unclear as to what had happened and her whereabouts, but her wilderness training had taught her to assess, to plan, to be smart. There was the injured eye, or damage around, and the arm hurting like hell. Her side also ached; probably a broken rib or ribs. Her right knee was smashed and, most alarming, blood seeped steadily from two deep gashes on the side of her left leg. Using just her uninjured arm, Shawler dug into her backpack and removed her first-aid kit. She managed to wrap her wounds with gauze and a bandage that would, she hoped, stem the bleeding. Then she put on her extra layers. Her bright red jacket helped with the wind, but the cold was unrelenting. She was already losing feeling in her feet. Next, Shawler pulled a small plastic packet from her first-aid kit. As a Christmas gift the previous year, her brother Evan had sent her some Mylar emergency blankets. (He was studying to be a physician and had recently completed a wilderness medicine course.) His note read something to the effect of You like doing things outdoors. Throw a couple of these into your first-aid kit. You never know. Shawler had thought it was an odd gift, but also kind of cool, in that preparedness-geek kind of way. Now, halfway up the rocky face of a mountain called the Devil’s Bedstead in the Pioneer Mountains of central Idaho, Shawler tore open the package, unfolded the bright silver blanket, and wrapped it tightly around herself. Shawler grew up everywhere. Before college, the family moved 10 times, following her father’s work as an executive in the eyecare business. By the time she reached Middlebury, Shawler had lived in Singapore, China, Germany, Florida, Georgia, North Carolina, Florida (again), South Korea, and Singapore (again). During high school in Asia, she swam and ran track and cross-country. It was only at Middlebury that she got into outdoor pursuits like biking, skiing, and hiking. She joined the Mountain Club and, when not studying for her degree in conservation biology, went on many adventures that would sound familiar to just about anyone who has an affinity for the mountains and has lived in Vermont. She became a Mountain Club guide, took a Wilderness First Responder course, and renewed her certification in 2014. Soon after graduating, Shawler moved to Ketchum, Idaho, where she mixed contract work and volunteer hours for local conservation groups, including one called the Wood River Wolf Project. She took advantage of easy access to the outdoors, biking throughout the area and hiking many peaks in and around the Pioneers, often by herself. She loved being around friends, but there was something meditative about experiencing nature without talking, without anyone but the self. Before the hike, Shawler texted some friends to tell them where she was going and when she expected to return, as she always did before heading into the backcountry. She had her first-aid gear in her pack, as well as extra food, water, clothes, and an emergency satellite beacon. The first part of the hike cuts through a Douglas fir forest before rising past the timberline and then ascending by way of a series of switchbacks. Shawler could see that fresh snow had fallen on the slate gray slopes above, but the snow was melting. Around 11:00 a.m., she came to a juncture. It wasn’t a fork, per se: at that elevation, roughly 9,400 feet, trails fade away and ascents become scrambles pointed in a specific direction. But it was a juncture in the “choice” sense of the word: continue the steady traverse up from the mountain’s saddle, or take a more direct, and somewhat more exposed, route. Seeing that the more challenging route looked fun and doable, Shawler decided to take it. Within an hour, however, her fun scramble transformed into a dangerous predicament. The slushy snow was refreezing, turning nearly every rock into a treacherous slick. Pausing on a living-room-sized ledge, she could see that the route she had ascended was falling into shadows and icing over completely. Descending that path looked like a poor option. She even tested this hypothesis, attempting to walk downhill a bit, but a quick stumble confirmed her thinking. There would be no U-turn. Shawler sat down to try and calm her nerves. She ate half of her leftover pasta lunch, saving the rest just in case. Peering further up the slope, she could see that conditions were drier. From there, she guessed a safer traverse and descent would be possible. But it was also a steep climb to get there, perhaps 70 feet. She assessed the risk and didn’t like the result: a fall here would be serious, if not deadly. She took out her iPhone and walked all around the ledge, trying unsuccessfully to get a signal. She dialed 911, anyway. Nothing. “Searching,” the screen declared with perfect indifference. This picture was taken nearly two years after the fall at Devil's Bedstead. Shawler's wounds—the lacerations to her head, right elbow, and left knee; the fractured left radius and orbital bone below her left eye; the three fractured ribs and right kneecap; and the puncture wounds to her lip and cheek—have healed. The memories remain. Fear arrived in earnest. Shawler yelled for help, knowing full well that it was a waste of energy, that any hikers on the trail to Kane Lake were far too far away. She cursed, loud, angry at herself for landing in this situation. Her friends wouldn’t expect her home yet, and by the time anyone noted her absence, it would be too late in the day to mobilize an emergency response. Nighttime on the mountain, with limited clothing and freezing temperatures, would likely kill her. Shawler had no choice but to climb. Reexamining the slope above, she felt that if she could just get past that tough section, she would be on that safer route. It was a huge risk, but it also wasn’t; not when the only other move was to stay put and try not to freeze to death. Shawler felt a rush of adrenaline as she began to make her way closer to safety. The climb went smoothly, for almost 60 feet, until that one rock near the top. That one rock that came loose and sent Shawler tumbling. Wrapped in the Mylar blanket and shivering, Shawler knew that, barring some freakish good fortune—another hiker, maybe, or an emergency beacon miracle—she was going to die. She grew heartsick thinking of the sadness that would soon befall her family and friends, and she felt selfish for having opted for the slightly more challenging route. She began to reflect on death, and on the varied nature of those reflections. She thought about her family and friends, of course, and how unfair it was that her torment and sadness would soon end in sleep, while theirs would persist. She also wondered what photograph would accompany newspaper coverage of her fatal accident. She even thought about the young guy from Vermont. He was her same age and, although they had never met, Shawler remembered reading about him, that he had died in a hiking accident just a year ago. Wasn’t that near here, near this place where I’m lying, broken and freezing? Then Shawler heard a strange mammalian screech. Eeeeep! Eeeeep! She lifted her head and saw a pika, an animal that looks like a mashup of a mouse, squirrel, and rabbit. The pika was perched on a rock nearby, as much at home in this environment as injured Shawler was not. Shawler wondered if she was hallucinating, but in a way it didn’t matter: the pika’s jolting call stirred her, urged her to sit up straighter, pull the blanket in closer, and resist sleep at all costs. As she repositioned herself, Shawler felt the phone in her backpack side pocket. She pulled it out and saw that the battery life was down to about 10 percent. The area had no coverage; she had already checked, from this very spot, before her fall. She thought about using the remaining battery juice to record a goodbye video. She didn’t know precisely what she would say, but it would be some blend of apology, gratefulness, love, and please don’t stay sad. It would be the kind of goodbye message that people with the foresight and ability to do so often record in tragic situations like this one. Yet how to pull it off without sounding cliché? And how to do it without crying, because surely if she cried that would make it harder, not easier, on those watching it after she was gone. So she reconsidered. Recording that message, she realized, would have been the first step in giving up, and Shawler wasn’t ready to give up. Instead, she dialed 911. She tried 13 more times. Then, at 2:55 in the afternoon, Avery Shawler heard a ringtone, and then a person. Dispatch: Blaine County 911, what’s the address of your emergency? Nine-one-one, do you have an emergency? Shawler: I was climbing a mountain and I fell . . .
Dispatch: Okay, you fell off while rock climbing? Shawler: I don’t know. . . . I don’t know. Dispatch: Were you rock climbing? Shawler: Well, I was climbing this peak. Shawler: Well, yeah. Oh, wow, I . . .
Dispatch: How far did you fall? Shawler: I don’t know, but my leg is torn up and I don’t know where I am. Dispatch: Okay. Do you know what mountain it was you were climbing up? Shawler: I’m afraid that I can . . . can’t, you know. Dispatch: Okay. And what’s the telephone number, is that a deactivated cell phone? Shawler: Is it a what? Dispatch: That cell phone you’re using, is that a deactivated one? Dispatch: So what’s your cell phone number? A minute later, the line went dead. Up on the ledge, Shawler thought she heard a helicopter a few times, but it was just the wind. Maybe no one is coming, she thought. Rod Gregg, a 51-year-old former police officer, was working as a 911 dispatcher for Blaine County. The connection with the injured woman had failed, but she called back immediately. 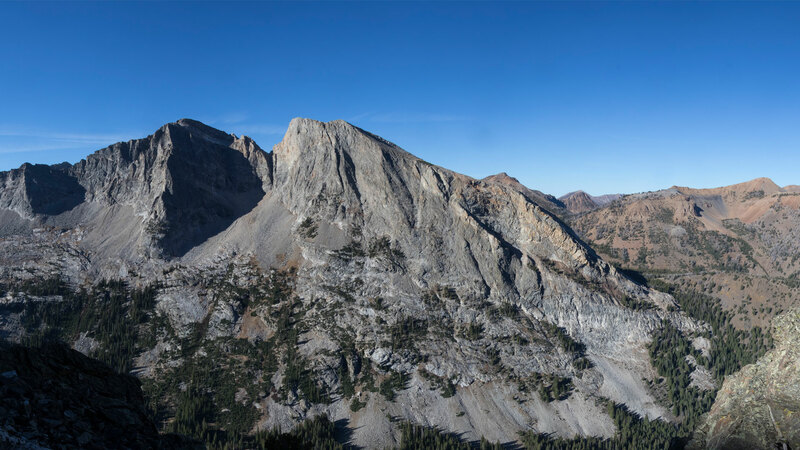 This time, before the call dropped away again, Gregg and a colleague were able to learn that she was not on Bald Mountain (the main peak at Sun Valley Resort and a popular hiking area). They needed a lot more to go on, but it was a start. The dispatchers tried calling Shawler back, but both attempts went straight to voicemail. Then Shawler’s third call made it through to Gregg, and this time he kept her on the line for 35 minutes, gathering information about her location and injuries, and encouraging her to stay alert. Help was coming. But Gregg could hear that Shawler was deteriorating. Shawler: I want to go to sleep. Gregg: Don’t go to—just stay awake for me, okay? Sixteen times during those 35 minutes, Gregg promised Shawler that rescuers would find her and get her out of there. Local authorities tried to triangulate her location using cellular data, but that only works if there are multiple nodes in a network connecting with a device. Shawler’s phone was only reaching one tower, and with a weak signal at that. Instead, through steady and supportive questioning, Gregg was able to jog Shawler’s memory, drawing out critical details about her day and her whereabouts—where she had parked, what she could see from her perch, which way she was facing, her probable elevation. From these clues, Gregg and other emergency responders were able to approximate her location. Gregg: It is, it’s on the way. Up on the ledge, Shawler thought she heard a helicopter a few times, but it was just the wind. Maybe no one is coming, she thought. Weak, cold, and alone, Shawler was nevertheless alert enough to know that her concussion and hypothermia might be messing with her mind. Perhaps she had imagined the 911 call. What about the pika? Was that even real? Then, breaking the silence like a thunderclap, a helicopter appeared overhead. Its approach was not from the valley below, as Shawler had anticipated, but from above, from behind the mountain summit. The sound and whipping wind were overwhelming, as was the sense of relief. Shawler didn’t know it at the time, but the fact that a helicopter had reached her so quickly, and that it was this particular helicopter, was yet another stroke of improbable good fortune. Based near Kalispell, Montana, the crew happened to be on a search nearby, just about 60 miles from Shawler’s position in the Pioneers. At 4:20 p.m., when the pilot got word of the injured hiker, he steered the Bell 429 aircraft south, reaching the search area in less than 20 minutes. Landing anywhere nearby would have been out of the question, but this helicopter was equipped with a special cable for exactly this kind of extraction mission. Thanks to the bright silver space blanket, the crew spotted Shawler almost immediately. In video footage taken from the aircraft during the rescue, Shawler—bloodied and half asleep—smiles wide. Her astonishing good luck is almost enough to make a nonbeliever wonder about fate. In fact, not long after her ordeal, Shawler, received a note from a colleague saying that a self-described clairvoyant had dropped by the office looking for Shawler. She had a message. The woman claimed to have spoken to Luke Richardson’s spirit. Luke was the young man from Vermont who had died on the Devil’s Bedstead the previous summer, no more than a few hundred feet from where Shawler had been rescued. The clairvoyant wanted to tell Shawler that Luke was the reason for the telecommunications miracle. Luke saved her life. Shawler never followed up with the woman, and she isn’t about to trade biology for parapsychology. (For the record, I have it on good authority, which is to say physics professor Rich Wolfson, that a change from zero to one bar is not outside the range of random fluctuations or small changes to signal strength that can occur due to factors such as humidity or clouds.) Yet Shawler isn’t in a hurry to wave the thought aside, either. “I feel so guilty that I survived but he didn’t,” she told me. The possibility, however remote, that Luke helped is a heartening one, and so she holds on to it. One of these days, she added, she will reach out to the Richardson family. She just hasn’t yet found the right way, the right words. In the meantime, Shawler spends most days continuing to be the vivacious explorer and driven scholar that her family and friends know her to be. While living in Ketchum, she had thought about graduate school, but figured she would get around to it at some point in the future. But the accident altered her attitude toward time. She jumped into the application process and is now pursuing her PhD in environmental science, focusing her research on wildlife conservation. When it comes to risk, Shawler does think her experience changed her: if she was a 7 out of 10 on the risky-behavior scale before, today she says she is a 5. Yet she cringes to think that any expression of restraint, let alone this very public one, might be misconstrued as her telling others not to have adventures, not to take risks. That couldn’t be further from the truth. As if to underscore the point, we spend a good portion of the afternoon talking about Shawler’s upcoming summer in Wyoming and her field research deep in grizzly country. Shawler laughs, clearly happy with the path she’s chosen. Writer David Wolman lives in Portland, Oregon. He is a 4 out of 10 on the risky-behavior scale. His latest book is about cowboys, and will be published in the spring by HarperCollins. Follow him @davidwolman.